Before getting into the details of MySQL Group Replication, this section introduces some background concepts and an overview of how things work. This provides some context to help understand what is required for Group Replication and what the differences are between classic asynchronous MySQL Replication and Group Replication. In the two pictures above, you can see a diagram of the classic asynchronous MySQL Replication protocol (and its semisynchronous variant as well). Blue arrows represent messages exchanged between servers or messages exchanged between servers and the client application. Group Replication enables you to create fault-tolerant systems with redundancy by replicating the system state throughout a set of servers. Consequently, even if some of the servers fail, as long it is not all or a majority, the system is still available, and all it could have degraded performance or scalability, it is still available. Server failures are isolated and independent. They are tracked by a group membership service which relies on a distributed failure detector that is able to signal when any servers leave the group, either voluntarily or due to an unexpected halt. There is a distributed recovery procedure to ensure that when servers join the group they are brought up to date automatically. There is no need for server fail-over, and the multi-master update everywhere nature ensures that not even updates are blocked in the event of a single server failure. Therefore MySQL Group Replication guarantees that the database service is continuously available. It is important to understand that although the database service is available, in the event of a server crash, those clients connected to it must be redirected, or failed over, to a different server. This is not something Group Replication attempts to resolve. A connector, load balancer, router, or some form of middleware are more suitable to deal with this issue. This section presents details about some of the services that Group Replication builds on. There is a failure detection mechanism provided that is able to find and report which servers are silent and as such assumed to be dead. At a high level, the failure detector is a distributed service that provides information about which servers may be dead (suspicions). Later if the group agrees that the suspicions are probably true, then the group decides that a given server has indeed failed. This means that the remaining members in the group take a coordinated decision to exclude a given member. Suspicions are triggered when servers go mute. When server A does not receive messages from server B during a given period, a timeout occurs and a suspicion is raised. If a server gets isolated from the rest of the group, then it suspects that all others have failed. Being unable to secure agreement with the group (as it cannot secure a quorum), its suspicion does not have consequences. When a server is isolated from the group in this way, it is unable to execute any local transactions. 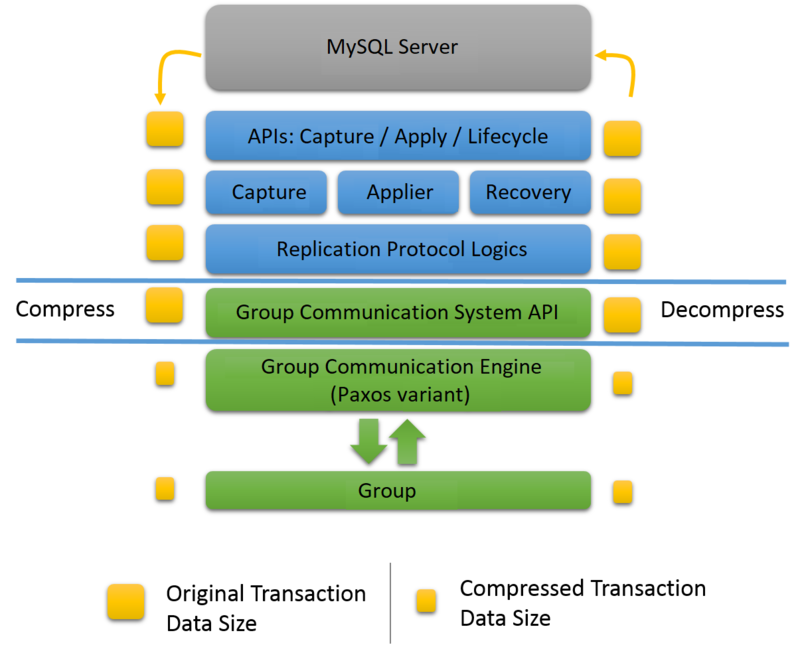 MySQL Group Replication builds on an implementation of the Paxos distributed algorithm to provide distributed coordination between servers. As such, it requires a majority of servers to be active to reach quorum and thus make a decision. This has direct impact on the number of failures the system can tolerate without compromising itself and its overall functionality. The number of servers (n) needed to tolerate f failures is then n = 2 x f + 1. In practice this means that to tolerate one failure the group must have three servers in it. As such if one server fails, there are still two servers to form a majority (two out of three) and allow the system to continue to make decisions automatically and progress. However, if a second server fails involuntarily, then the group (with one server left) blocks, because there is no majority to reach a decision. The following is a small table illustrating the formula above. The next Chapter covers technical aspects of Group Replication. MySQL Group Replication is provided as a plugin to MySQL server, and each server in a group requires configuration and installation of the plugin. This section provides a detailed tutorial with the steps required to create a replication group with at least three servers. Each of the server instances in a group can run on an independent physical machine, or on the same machine. This section explains how to create a replication group with three MySQL Server instances on one physical machine. This means that three data directories are needed, one per server instance, and that you need to configure each instance independently. This tutorial explains how to get and deploy MySQL Server with the Group Replication plugin, how to configure each server instance before creating a group, and how to use Performance Schema monitoring to verify that everything is working correctly. The first step is to deploy three instances of MySQL Server. Group Replication is a built-in MySQL plugin provided with MySQL Server 5.7.17 and later. For more background information on MySQL plugins, see Section 5.5, “MySQL Server Plugins”. This procedure assumes that MySQL Server was downloaded and unpacked into the directory named mysql-5.7. The following procedure uses one physical machine, therefore each MySQL server instance requires a specific data directory for the instance. Create the data directories in a directory named data and initialize each one. Inside data/s1, data/s2, data/s3 is an initialized data directory, containing the mysql system database and related tables and much more. To learn more about the initialization procedure, see Section 2.10.1.1, “Initializing the Data Directory Manually Using mysqld”. Do not use --initialize-insecure in production environments, it is only used here to simplify the tutorial. For more information on security settings, see Section 17.5, “Group Replication Security”. This section explains the configuration settings required for MySQL Server instances that you want to use for Group Replication. For background information, see Section 17.7.2, “Group Replication Limitations”. To install and use the Group Replication plugin you must configure the MySQL Server instance correctly. It is recommended to store the configuration in the instance's configuration file. See Section 4.2.6, “Using Option Files” for more information. Unless stated otherwise, what follows is the configuration for the first instance in the group, referred to as s1 in this procedure. The following section shows an example server configuration. These settings configure MySQL server to use the data directory created earlier and which port the server should open and start listening for incoming connections. The non-default port of 24801 is used because in this tutorial the three server instances use the same hostname. In a setup with three different machines this would not be required. Group Replication depends on a network connection between the members, which means that each member must be able to resolve the network address of all of the other members. For example in this tutorial all three instances run on one machine, so to ensure that the members can contact each other you could add a line to the option file such as report_host=127.0.0.1. The following settings configure replication according to the MySQL Group Replication requirements. These settings configure the server to use the unique identifier number 1, to enable global transaction identifiers and to store replication metadata in system tables instead of files. Additionally, it instructs the server to turn on binary logging, use row-based format and disable binary log event checksums. For more details see Section 17.7.1, “Group Replication Requirements”. At this point the my.cnf file ensures that the server is configured and is instructed to instantiate the replication infrastructure under a given configuration. The following section configures the Group Replication settings for the server. The loose- prefix used for the group_replication variables above instructs the server to continue to start if the Group Replication plugin has not been loaded at the time the server is started. Configuring transaction_write_set_extraction instructs the server that for each transaction it has to collect the write set and encode it as a hash using the XXHASH64 hashing algorithm. Configuring group_replication_group_name tells the plugin that the group that it is joining, or creating, is named "aaaaaaaa-aaaa-aaaa-aaaa-aaaaaaaaaaaa". Configuring group_replication_start_on_boot instructs the plugin to not start operations automatically when the server starts. This is important when setting up Group Replication as it ensures you can configure the server before manually starting the plugin. Once the member is configured you can set group_replication_start_on_boot to on so that Group Replication starts automatically upon server boot. Configuring group_replication_local_address tells the plugin to use the network address 127.0.0.1 and port 24901 for internal communication with other members in the group. Group Replication uses this address for internal member-to-member connections using XCom. This address must be different to the hostname and port used for SQL and it must not be used for client applications. It must be reserved for internal communication between the members of the group while running Group Replication. The network address configured by group_replication_local_address must be resolvable by all group members. For example, if each server instance is on a different machine with a fixed network address you could use the IP of the machine, such as 10.0.0.1. If you use hostnames then you must use a fully qualified name and ensure it is resolvable through DNS, correctly configured /etc/hosts files, or other name resolution processes. The recommended port for group_replication_local_address is 33061. In this tutorial we use three server instances running on one machine, thus ports 24901 to 24903 are used for the internal communication network address. Configuring group_replication_group_seeds sets the hostname and port of the group members which are used by the new member to establish its connection to the group. These members are called the seed members. Once the connection is established, the group membership information is listed at performance_schema.replication_group_members. Usually the group_replication_group_seeds list contains the hostname:port of each of the group member's group_replication_local_address, but this is not obligatory and a subset of the group members can be chosen as seeds. The hostname:port listed in group_replication_group_seeds is the seed member's internal network address, configured by group_replication_local_address and not the SQL hostname:port used for client connections, and shown for example in performance_schema.replication_group_members table. The server that starts the group does not make use of this option, since it is the initial server and as such, it is in charge of bootstrapping the group. In other words, any existing data which is on the server bootstrapping the group is what is used as the data for the next joining member. The second server joining asks the one and only member in the group to join, any missing data on the second server is replicated from the donor data on the bootstrapping member, and then the group expands. The third server joining can ask any of these two to join, data is synchronized to the new member, and then the group expands again. Subsequent servers repeat this procedure when joining. When joining multiple servers at the same time, make sure that they point to seed members that are already in the group. Do not use members that are also joining the group as as seeds, because they may not yet be in the group when contacted. It is good practice to start the bootstrap member first, and let it create the group. Then make it the seed member for the rest of the members that are joining. This ensures that there is a group formed when joining the rest of the members. Creating a group and joining multiple members at the same time is not supported. It may work, but chances are that the operations race and then the act of joining the group ends up in an error or a time out. Configuring group_replication_bootstrap_group instructs the plugin whether to bootstrap the group or not. This option must only be used on one server instance at any time, usually the first time you bootstrap the group (or in case the entire group is brought down and back up again). If you bootstrap the group multiple times, for example when multiple server instances have this option set, then they could create an artificial split brain scenario, in which two distinct groups with the same name exist. Disable this option after the first server instance comes online. Configuration for all servers in the group is quite similar. You need to change the specifics about each server (for example server_id, datadir, group_replication_local_address). This is illustrated later in this tutorial. In the following example the user rpl_user with the password password is shown. When configuring your servers use a suitable user name and password. Binary logging is enabled again once the user is created. The mysql.session user must exist before you can load Group Replication. mysql.session was added in MySQL version 5.7.19. If your data dictionary was initialized using an earlier version you must run the mysql_upgrade procedure. If the upgrade is not run, Group Replication fails to start with the error message There was an error when trying to access the server with user: mysql.session@localhost. Make sure the user is present in the server and that mysql_upgrade was ran after a server update..
To start the group, instruct server s1 to bootstrap the group and then start Group Replication. This bootstrap should only be done by a single server, the one that starts the group and only once. This is why the value of the bootstrap configuration option was not saved in the configuration file. If it is saved in the configuration file, upon restart the server automatically bootstraps a second group with the same name. This would result in two distinct groups with the same name. The same reasoning applies to stopping and restarting the plugin with this option set to ON. The information in this table confirms that there is a member in the group with the unique identifier ce9be252-2b71-11e6-b8f4-00212844f856, that it is ONLINE and is at myhost listening for client connections on port 24801. For the purpose of demonstrating that the server is indeed in a group and that it is able to handle load, create a table and add some content to it. Check the content of table t1 and the binary log. As seen above, the database and the table objects were created and their corresponding DDL statements were written to the binary log. Also, the data was inserted into the table and written to the binary log. The importance of the binary log entries is illustrated in the following section when the group grows and distributed recovery is executed as new members try to catch up and become online. At this point, the group has one member in it, server s1, which has some data in it. It is now time to expand the group by adding the other two servers configured previously. In order to add a second instance, server s2, first create the configuration file for it. The configuration is similar to the one used for server s1, except for things such as the location of the data directory, the ports that s2 is going to be listening on or its server_id. These different lines are highlighted in the listing below. Similar to the procedure for server s1, with the option file in place you launch the server. Then configure the recovery credentials as follows. The commands are the same as used when setting up server s1 as the user is shared within the group. Issue the following statements on s2. Install the Group Replication plugin and start the process of joining the server to the group. The following example installs the plugin in the same way as used while deploying server s1. Add server s2 to the group. Unlike the previous steps that were the same as those executed on s1, here there is a difference in that you do not issue SET GLOBAL group_replication_bootstrap_group=ON; before starting Group Replication, because the group has already been created and bootstrapped by server s1. At this point server s2 only needs to be added to the already existing group. When Group Replication starts successfully and the server joins the group it checks the super_read_only variable. By setting super_read_only to ON in the member's configuration file, you can ensure that servers which fail when starting Group Replication for any reason do not accept transactions. If the server should join the group as read-write instance, for example as the primary in a single-primary group or as a member of a multi-primary group, when the super_read_only variable is set to ON then it is set to OFF upon joining the group. Checking the performance_schema.replication_group_members table again shows that there are now two ONLINE servers in the group. As server s2 is also marked as ONLINE, it must have already caught up with server s1 automatically. Verify that it has indeed synchronized with server s1 as follows. As seen above, the second server has been added to the group and it has replicated the changes from server s1 automatically. According to the distributed recovery procedure, this means that just after joining the group and immediately before being declared online, server s2 has connected to server s1 automatically and fetched the missing data from it. In other words, it copied transactions from the binary log of s1 that it was missing, up to the point in time that it joined the group. 3. Configure the recovery credentials for the group_replication_recovery channel. 4. Install the Group Replication plugin and start it. At this point server s3 is booted and running, has joined the group and caught up with the other servers in the group. Consulting the performance_schema.replication_group_members table again confirms this is the case. The following sections describe the information available in each of these tables. The performance_schema.replication_group_member_stats table provides information related to the certification process. The information is shared between all the server instances that are members of the replication group, so information on all the group members can be queried from any member. The member server UUID. This has a different value for each member in the group. This also serves as a key since it is unique to each member. This table is used for monitoring the status of the different server instances that are tracked in the current view, or in other words are part of the group and as such are tracked by the membership service. The network address of the group member. The MySQL connection port on which the group member is listening. The current state of the group member (which can be ONLINE, ERROR, RECOVERING, OFFLINE or UNREACHABLE). For more information about the Member_host value and its impact on the distributed recovery process, see Section 17.2.1.3, “User Credentials”. When connected to a group, some fields in this table show information regarding Group Replication. For instance, the transactions that have been received from the group and queued in the applier queue (the relay log). Shows the value of the name of the group. It is always a valid UUID. Shows the identifier for the group. It is similar to the group name and it is used as the UUID for all the transactions that are generated during group replication. Transactions in this GTID set have been received by this member of the group. The state of the Group Replication related channels and threads can be observed using the regular replication_applier_status table as well. If there are many different worker threads applying transactions, then the worker tables can also be used to monitor what each worker thread is doing. Shows whether the applier service is ON or OFF. Shows whether there is some applier delay configured. The number of retries performed while applying a transaction. The table replication_group_members is updated whenever there is a view change, for example when the configuration of the group is dynamically changed. At that point, servers exchange some of their metadata to synchronize themselves and continue to cooperate together. There are various states that a server instance can be in. If servers are communicating properly, all report the same states for all servers. However, if there is a network partition, or a server leaves the group, then different information may be reported, depending on which server is queried. Note that if the server has left the group then obviously it cannot report updated information about other servers' state. If there is a partition, such that quorum is lost, servers are not able to coordinate between themselves. As a consequence, they cannot guess what the status of different servers is. Therefore, instead of guessing their state they report that some servers are unreachable. Whenever the local failure detector suspects that a given server is not reachable, because maybe it has crashed or was disconnected involuntarily, it shows that server's state as 'unreachable'. This section describes the different modes of deploying Group Replication, explains common operations for managing groups and provides information about how to tune your groups. . The default mode is single-primary. It is not possible to have members of the group deployed in different modes, for example one configured in multi-primary mode while another one is in single-primary mode. To switch between modes, the group and not the server, needs to be restarted with a different operating configuration. Regardless of the deployed mode, Group Replication does not handle client-side fail-over, that must be handled by the application itself, a connector or a middleware framework such as a proxy or router. In this mode the group has a single-primary server that is set to read-write mode. All the other members in the group are set to read-only mode (with super-read-only=ON ). This happens automatically. The primary is typically the first server to bootstrap the group, all other servers that join automatically learn about the primary server and are set to read only. When in single-primary mode, some of the checks deployed in multi-primary mode are disabled, because the system enforces that only a single server writes to the group. For example, changes to tables that have cascading foreign keys are allowed, whereas in multi-primary mode they are not. Upon primary member failure, an automatic primary election mechanism chooses the next primary member. The method of choosing the next primary depends on the server's server_uuid variable and the group_replication_member_weight variable. In the event that the primary member leaves a single-primary group, then an election is performed and a new primary is chosen from the remaining servers in the group. This election is performed by looking at the new view, and ordering the potential new primaries based on the value of group_replication_member_weight. Assuming the group is operating with all members running the same MySQL version, then the member with the highest value for group_replication_member_weight is elected as the new primary. In the event that multiple servers have the same group_replication_member_weight, the servers are then prioritized based on their server_uuid in lexicographical order and by picking the first one. Once a new primary is elected, it is automatically set to read-write and the other secondaries remain as secondaries, and as such, read-only. If the group is operating with members that are running different versions of MySQL then the election process can be impacted. For example, if any member does not support group_replication_member_weight, then the primary is chosen based on server_uuid order from the members of the lower major version. Alternatively, if all members running different MySQL versions do support group_replication_member_weight, the primary is chosen based on group_replication_member_weight from the members of the lower major version. It is a good practice to wait for the new primary to apply its replication related relay-log before re-routing the client applications to it. In multi-primary mode, there is no notion of a single primary. There is no need to engage an election procedure since there is no server playing any special role. The following example shows how to find out which server is currently the primary when deployed in single-primary mode. This section explains how to back up and subsequently restore a Group Replication member using MySQL Enterprise Backup; the same technique can be used to quickly add a new member to a group. Generally, backing up a Group Replication member is no different to backing up a stand-alone MySQL instance. The recommended process is to use MySQL Enterprise Backup image backups and a subsequent restore, for more information see Backup Operations. Use MySQL Enterprise Backup to create a backup of the source server instance with simple timestamps. Copy the backup to the destination server instance. Use MySQL Enterprise Backup to restore the backup to the destination server instance. The --no-history-logging option is used because node2 is a secondary, and because it is read-only MySQL Enterprise Backup cannot write status and metadata tables to the instance. The backup is restored to the destination server. This ensures that Group Replication is not started on boot, that the member defaults to read-only and that the event_scheduler is turned off while the member catches up with the group during the recovery phase. Adequate error handling must be configured on the clients to recognise that they are, temporarily, prevented from performing DML during this period. This section explains how to secure a group, securing the connections between members of a group, or by establishing a security perimeter using address whitelisting. The Group Replication plugin has a configuration option to determine from which hosts an incoming Group Communication connection can be accepted. This option is called group_replication_ip_whitelist. If you set this option on a server s1, then when server s2 is establishing a connection to s1 for the purpose of engaging group communication, then s1 first checks the whitelist before accepting the connection from s2. If s2 is in the whitelist, then s1 accepts the connection, otherwise s1 rejects the connection attempt by s2. If you do not specify a whitelist explicitly, the server automatically sets the whitelist to the private networks that the server has an interface on. This means that a server, even if it has interfaces on public IPs, does not by default allow connections from external hosts. The localhost IP address (127.0.0.1) is always added to the whitelist. If not explicitly, it is implicitly and automatically added. IPv6 addresses, and host names that resolve to IPv6 addresses, are not supported. To join a replication group, a server only needs to be whitelisted on the seed member to which it makes the request to join the group. Typically, this would be the bootstrap member for the replication group, but it can be any of the servers listed by the --loose-group_replication_group_seeds option in the configuration for the server joining the group. However, note that when the replication group is reconfigured, the group members re-establish connections between themselves. If a group member is only whitelisted by servers that are no longer part of the replication group after the reconfiguration, it is unable to reconnect to the remaining servers in the replication group that do not whitelist it. To avoid this scenario entirely, specify the same whitelist for all servers that are members of the replication group. MySQL Group Replication supports both OpenSSL and YaSSL builds of MySQL Server. Group communication connections as well as recovery connections, are secured using SSL. The following sections explain how to configure connections. Recovery is performed through a regular asynchronous replication connection. 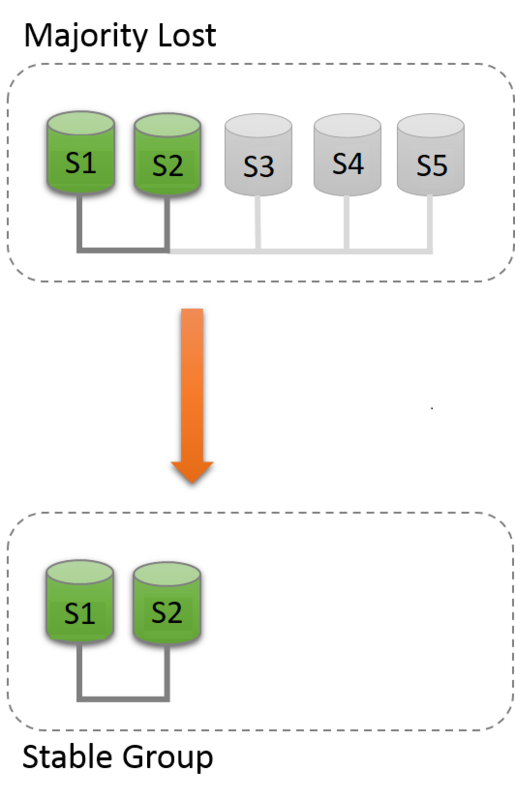 Once the donor is selected, the server joining the group establishes an asynchronous replication connection. This is all automatic. However, a user that requires an SSL connection must have been created before the server joining the group connects to the donor. Typically, this is set up at the time one is provisioning a server to join the group. Assuming that all servers already in the group have a replication user set up to use SSL, you configure the server joining the group to use those credentials when connecting to the donor. That is done according to the values of the SSL options provided for the Group Replication plugin. And by configuring the recovery channel to use the credentials of the user that requires an SSL connection. Secure sockets can be used to establish communication between members in a group. The configuration for this depends on the server's SSL configuration. As such, if the server has SSL configured, the Group Replication plugin also has SSL configured. For more information on the options for configuring the server SSL, see Section 6.4.2, “Command Options for Encrypted Connections”. The options which configure Group Replication are shown in the following table. Path of key file. To be used as client and server certificate. Path of certificate file. To be used as client and server certificate. Path of file with SSL Certificate Authorities that are trusted. Path of directory containing certificates for SSL Certificate Authorities that are trusted. Path of file containing the certificate revocation lists. Path of directory containing revoked certificate lists. Permitted ciphers to use while encrypting data over the connection. Secure communication will use this version and its protocols. These options are MySQL Server configuration options which Group Replication relies on for its configuration. In addition there is the following Group Replication specific option to configure SSL on the plugin itself. group_replication_ssl_mode - specifies the security state of the connection between Group Replication members. Establish an unencrypted connection (default). Establish a secure connection if the server supports secure connections. Like REQUIRED, but additionally verify the server TLS certificate against the configured Certificate Authority (CA) certificates. Like VERIFY_CA, but additionally verify that the server certificate matches the host to which the connection is attempted. The following example shows an example my.cnf file section used to configure SSL on a server and how activate it for Group Replication. The only plugin specific configuration option that is listed is group_replication_ssl_mode. This option activates the SSL communication between members of the group, by configuring the SSL framework with the ssl_* parameters that are provided to the server. There is nothing preventing Group Replication from operating over a virtual private network. At its core, it just relies on an IPv4 socket to establish connections between servers for the purpose of propagating messages between them. These are the system variables that are specific to the Group Replication plugin. Every configuration option is prefixed with "group_replication". Although most variables are described as dynamic and can be changed while the server is running, most changes only take effect upon restarting the Group Replication plugin. Variables which can be changed without requiring a restart of the plugin are specifically noted as such in this section. Deprecated in version 5.7.21 and scheduled for removal in a future version. Allow the current server to join the group even if it has transactions not present in the group. Use caution when enabling this option as incorrect usage could lead to inconsistencies in the group. Allow the current server to join the group even if it has a lower plugin version than the group. Determines the interval between successive column values for transactions that execute on this server instance. Configure this server to bootstrap the group. This option must only be set on one server and only when starting the group for the first time or restarting the entire group. After the group has been bootstrapped, set this option to OFF. It should be set to OFF both dynamically and in the configuration files. Starting two servers or restarting one server with this option set while the group is running may lead to an artificial split brain situation, where two independent groups with the same name are bootstrapped. Timeout, in seconds, that Group Replication waits for each of the components when shutting down. The value in bytes above which (LZ4) compression is enforced. When set to zero, deactivates compression. Enable or disable strict consistency checks for multi-primary update everywhere. Specifies the number of waiting transactions in the applier queue that trigger flow control. This variable can be changed without resetting Group Replication. Specifies the number of waiting transactions in the certifier queue that trigger flow control. This variable can be changed without resetting Group Replication. Specifies the mode used for flow control. This variable can be changed without resetting Group Replication. A list of peer addresses as a comma separated list such as host1:port1,host2:port2. This option is used to force a new group membership, in which the excluded members do not receive a new view and are blocked. You need to manually kill the excluded servers. Any invalid host names in the list could cause subsequent START GROUP_REPLICATION statements to fail because they could block group membership. The name of the group which this server instance belongs to. Must be a valid UUID. A list of group members that provide a member which joins the group with the data required for the joining member to gain synchrony with the group. The list consists of the seed member's network addresses specified as a comma separated list, such as host1:port1,host2:port2. Ususally this list consists of all members of the group, but you can choose a subset of the group members to be seeds. The list must contain at least one valid member address. Each address is validated when starting Group Replication. If the list does not contain any valid host names, issuing START GROUP_REPLICATION fails. Specifies which hosts are permitted to connect to the group. By default, this system variable is set to AUTOMATIC, which permits connections from private subnetworks active on the host. Active interfaces on the host are scanned and those with addresses on private subnetworks are automatically added to the permitted list. Address 127.0.0.1 is always permitted to connect, even when not specified explicitly. IPv6 addresses, and host names that resolve to IPv6 addresses, are not supported. The network address which the member provides for connections from other members, specified as a host:port formatted string. This address must be reachable by all members of the group because it is used by XCOM, the internal group communication system. Do not use this address for communication with the member. Other Group Replication members contact this member through this host:port for all internal group communication. This is not the MySQL server SQL protocol host and port. A percentage weight that can be assigned to members to influence the chance of the member being elected as primary in the event of failover, for example when the existing primary leaves a single-primary group. Assign numeric weights to members to ensure that specific members are elected, for example during scheduled maintenance of the primary or to ensure certain hardware is prioritized in the event of failover. during election of a new primary the members above would be sorted as member-2, member-3, member-4, and member-1. This results in member-2 being chosen as the new primary in the event of failover. For more information, see Section 17.4.1.1, “Single-Primary Mode”. The number of times the group communication thread waits for the communication engine mutex to be released before the thread waits for more incoming network messages. The number of times that the member that is joining tries to connect to the available donors before giving up. The sleep time, in seconds, between reconnection attempts when no donor was found in the group. Whether Group Replication recovery connection should use SSL or not. The path to a file that contains a list of trusted SSL certificate authorities. The path to a directory that contains trusted SSL certificate authority certificates. The path to a directory that contains files containing certificate revocation lists. Make the recovery process check the server's Common Name value in the donor sent certificate. 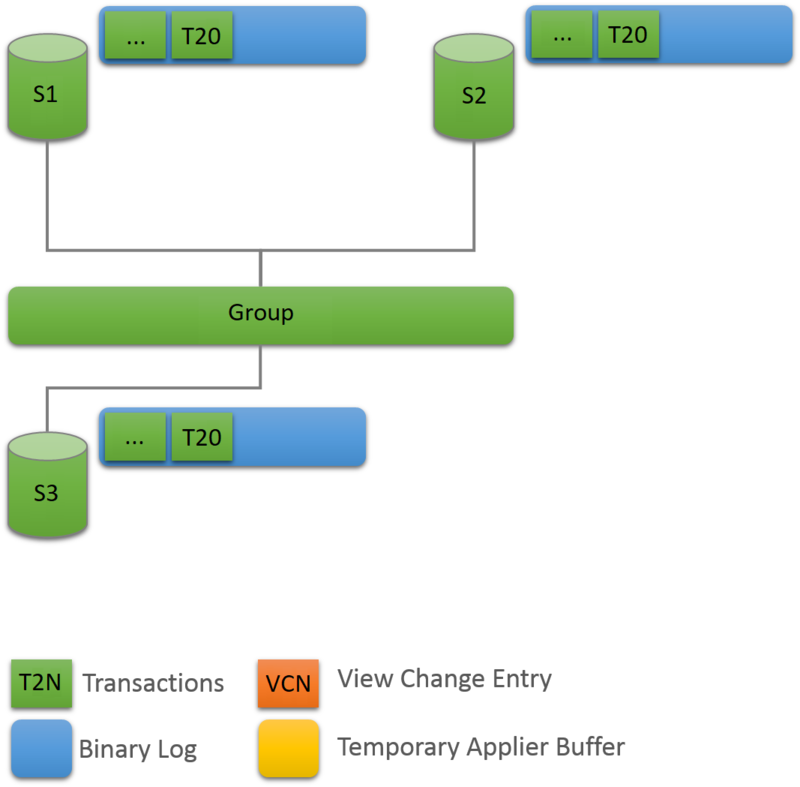 Recovery policies when handling cached transactions after state transfer. This option specifies whether a member is marked online after it has received all transactions that it missed before it joined the group (TRANSACTIONS_CERTIFIED) or after it has received and applied them (TRANSACTIONS_APPLIED). The number of consecutive GTIDs that are reserved for each member. Each member consumes its blocks and reserves more when needed. Instructs the group to automatically pick a single server to be the one that handles read/write workload. This server is the PRIMARY and all others are SECONDARIES. Specifies the security state of the connection between Group Replication members. Whether the server should start Group Replication or not during server start. Configures the maximum transaction size in bytes which the group accepts. Transactions larger than this size are rolled back. Use this option to avoid large transactions causing the group to fail. A large transaction can cause problems for a group, either in terms of memory allocation or network bandwidth consumption, which may cause the failure detector to trigger because a given member is unreachable while it is busy processing the large transaction. When set to 0 there is no limit to the size of transactions the group accepts, and there may be the risk of large transactions causing the group to fail. Adjust the value of this variable depending on the size of workload you require from the group. Configures how long members that suffer a network partition and cannot connect to the majority wait before leaving the group. By default set to 0, which means that members that find themselves in a minority due to a network partition wait forever to connect the group. 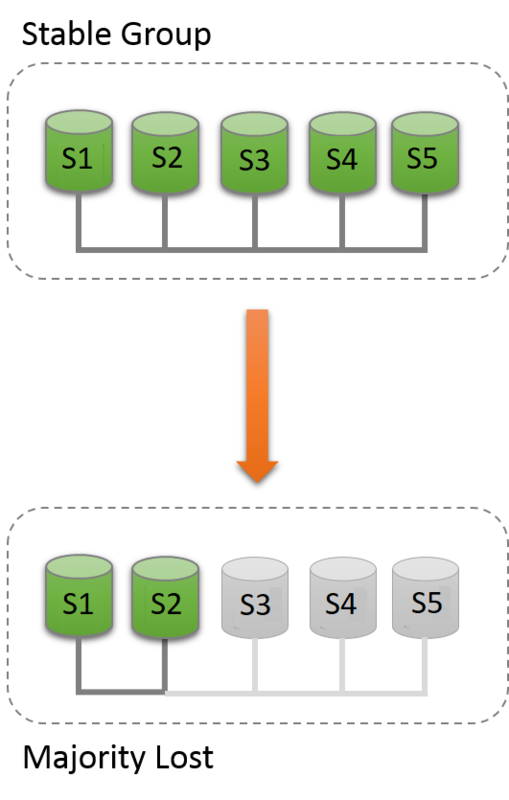 In a group of 5 servers (S1,S2,S3,S4,S5), if there is a disconnection between (S1,S2) and (S3,S4,S5) there is a network partition. The first group (S1,S2) is now in a minority because it cannot contact more than half of the group. While the majority group (S3,S4,S5) remains running, the minority group waits forever for a network reconnection. Any transactions processed by the minority group are blocked until Group Replication is stopped using STOP GROUP REPLICATION on the members of the minority. If configured to a number of seconds, members wait for this amount of time after losing contact with the majority of members before leaving the group. All pending transactions processed by the minority are rolled back and the servers in the minority partition move to the ERROR state and set themselves to super_read_only=ON mode. When you have a symmetric group, with just two members for example (S0,S2), if there is a network partition and there is no majority, after the configured timeout all members shut down and enter ERROR state. This section lists and explains the requirements and limitations of Group Replication. IPv4 Network. The group communication engine used by MySQL Group Replication only supports IPv4. Therefore, Group Replication requires an IPv4 network infrastructure. Network Performance. Group Replication is designed to be deployed in a cluster environment where server instances are very close to each other, and is impacted by both network latency as well as network bandwidth. Slave Updates Logged. Set --log-slave-updates. Servers need to log binary logs that are applied through the replication applier. Servers in the group need to log all transactions that they receive and apply from the group. This is required because recovery is conducted by relying on binary logs form participants in the group. Therefore, copies of each transaction need to exist on every server, even for those transactions that were not initiated on the server itself. Binary Log Row Format. Set --binlog-format=row. Group Replication relies on row-based replication format to propagate changes consistently among the servers in the group. It relies on row-based infrastructure to be able to extract the necessary information to detect conflicts among transactions that execute concurrently in different servers in the group. See Section 16.2.1, “Replication Formats”. Global Transaction Identifiers On. Set --gtid-mode=ON. Group Replication uses global transaction identifiers to track exactly which transactions have been committed on every server instance and thus be able to infer which servers have executed transactions that could conflict with already committed transactions elsewhere. In other words, explicit transaction identifiers are a fundamental part of the framework to be able to determine which transactions may conflict. See Section 16.1.3, “Replication with Global Transaction Identifiers”. Replication Information Repositories. Set --master-info-repository=TABLE and --relay-log-info-repository=TABLE. The replication applier needs to have the master information and relay log metadata written to the mysql.slave_master_info and mysql.slave_relay_log_info system tables. This ensures the Group Replication plugin has consistent recoverability and transactional management of the replication metadata. See Section 16.2.4.2, “Slave Status Logs”. Transaction Write Set Extraction. Set --transaction-write-set-extraction=XXHASH64 so that while collecting rows to log them to the binary log, the server collects the write set as well. The write set is based on the primary keys of each row and is a simplified and compact view of a tag that uniquely identifies the row that was changed. This tag is then used for detecting conflicts. Multi-threaded Appliers. Group Replication members can be configured as multi-threaded appliers, enabling transactions to be applied in parallel. Set --slave-parallel-workers=N (where N is the number of parallel applier threads), --slave-preserve-commit-order=1, and --slave-parallel-type=LOGICAL_CLOCK. Setting --slave-parallel-workers=N enables the multi-threaded applier on the member. Group Replication relies on consistency mechanisms built around the guarantee that all participating members receive and apply committed transaction in the same order, so you must also set --slave-preserve-commit-order=1 to ensure that the final commit of parallel transactions is in the same order as the original transactions. Finally, in order to determine which transactions can be executed in parallel, the relay log must contain transaction parent information generated with --slave-parallel-type=LOGICAL_CLOCK. Attempting to add a member with --slave-parallel-workers set to greater than 0 without also setting the other two options, generates an error and the instance is prevented from joining. The following known limitations exist for Group Replication. Group Replication is built on GTID based replication, therefore you should also be aware of Section 16.1.3.4, “Restrictions on Replication with GTIDs”. Replication Event Checksums. Due to a design limitation of replication event checksums, Group Replication cannot currently make use of them. Therefore set --binlog-checksum=NONE. Gap Locks. The certification process does not take into account gap locks, as information about gap locks is not available outside of InnoDB. See Gap Locks for more information. Unless you rely on REPEATABLE READ semantics in your applications, we recommend using the READ COMMITTED isolation level with Group Replication. InnoDB does not use gap locks in READ COMMITTED, which aligns the local conflict detection within InnoDB with the distributed conflict detection performed by Group Replication. Table Locks and Named Locks. The certification process does not take into account table locks (see Section 13.3.5, “LOCK TABLES and UNLOCK TABLES Syntax”) or named locks (see GET_LOCK()). SERIALIZABLE Isolation Level. SERIALIZABLE isolation level is not supported in multi-primary groups by default. Setting a transaction isolation level to SERIALIZABLE configures Group Replication to refuse to commit the transaction. Concurrent DDL versus DML Operations. Concurrent data definition statements and data manipulation statements executing against the same object but on different servers is not supported when using multi-primary mode. During execution of Data Definition Language (DDL) statements on an object, executing concurrent Data Manipulation Language (DML) on the same object but on a different server instance has the risk of conflicting DDL executing on different instances not being detected. Foreign Keys with Cascading Constraints. Multi-primary mode groups (members all configured with group_replication_single_primary_mode=OFF) do not support tables with multi-level foreign key dependencies, specifically tables that have defined CASCADING foreign key constraints. This is because foreign key constraints that result in cascading operations executed by a multi-primary mode group can result in undetected conflicts and lead to inconsistent data across the members of the group. Therefore we recommend setting group_replication_enforce_update_everywhere_checks=ON on server instances used in multi-primary mode groups to avoid undetected conflicts. In single-primary mode this is not a problem as it does not allow concurrent writes to multiple members of the group and thus there is no risk of undetected conflicts. Very Large Transactions. Individual transactions that result in GTID contents which are large enough that it cannot be copied between group members over the network within a 5 second window can cause failures in the group communication. To avoid this issue try and limit the size of your transactions as much as possible. For example, split up files used with LOAD DATA INFILE into smaller chunks. MySQL Enterprise Audit and MySQL Enterprise Firewall. Prior to version 5.7.21 MySQL Enterprise Audit and MySQL Enterprise Firewall use MyISAM tables in the mysql system database. Group Replication does not support MyISAM tables. If network bandwidth alone is an issue, then Section 17.9.7.2, “Message Compression” can be used to lower the bandwidth required. However, if the network drops packets, leading to re-transmissions and higher end-to-end latency, throughput and latency are both negatively affected. If SELinux is enabled, which you can verify using sestatus -v, then you need to enable the use of the Group Replication communication port, configured by group_replication_local_address, for mysqld so that it can bind to it and listen there. To see which ports MySQL is currently allowed to use, issue semanage port -l | grep mysqld. Assuming the port configured is 6606, add the necessary port to those permitted by SELinux by issuing semanage port -a -t mysqld_port_t -p tcp 6606. If iptables is enabled, then you need to open up the Group Replication port for communication between the machines. To see the current rules in place on each machine, issue iptables -L. Assuming the port configured is 6606, enable communication over the necessary port by issuing iptables -A INPUT -p tcp --dport 6606 -j ACCEPT. The replication channels used by Group Replication behave in the same way as replication channels used in master to slave replication, and as such rely on the relay log. In the event of a change of the relay_log variable, or when the option is not set and the host name changes, there is a chance of errors. See Section 16.2.4.1, “The Slave Relay Log” for a recovery procedure in this situation. Alternatively, another way of fixing the issue specifically in Group Replication is to issue a STOP GROUP_REPLICATION statement and then a START GROUP_REPLICATION statement to restart the instance. The Group Replication plugin creates the group_replication_applier channel again. 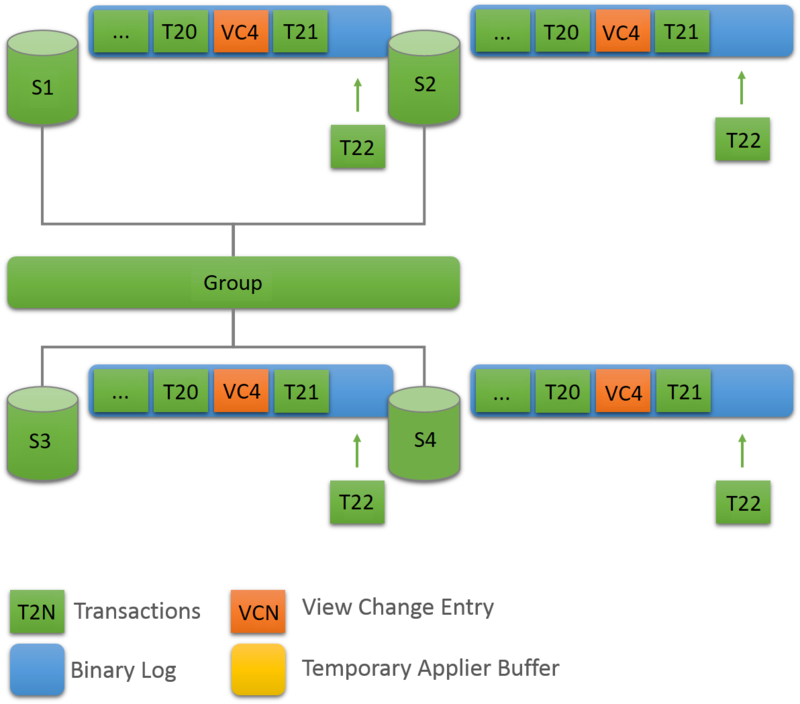 This section provides more technical details about MySQL Group Replication. The MySQL Group Replication plugin includes a set of APIs for capture, apply, and lifecycle, which control how the plugin interacts with MySQL Server (shown at the top of the figure). There are interfaces to make information flow from the server to the plugin and vice versa. These interfaces isolate the MySQL Server core from the Group Replication plugin, and are mostly hooks placed in the transaction execution pipeline. In one direction, from server to the plugin, there are notifications for events such as the server starting, the server recovering, the server being ready to accept connections, and the server being about to commit a transaction. In the other direction, the plugin instructs the server to perform actions such as committing or aborting ongoing transactions, or queuing transactions in the relay log. The final two layers of the Group Replication plugin architecture are the Group Communication System (GCS) API, and an implementation of a Paxos-based group communication engine. The GCS API is a high level API that abstracts the properties required to build a replicated state machine (see Section 17.1, “Group Replication Background”). It therefore decouples the implementation of the messaging layer from the remaining upper layers of the plugin. The group communication engine handles communications with the members of the replication group (shown at the bottom of the figure). If a server joins the group, it automatically brings itself up to date by fetching the missing state from an existing server. This state is transferred by means of Asynchronous MySQL replication. If a server leaves the group, for instance it was taken down for maintenance, the remaining servers notice that it has left and reconfigure the group automatically. The group membership service described at Section 17.1.3.2, “Group Membership” powers all of this. As there are no primary servers (masters) for any particular data set, every server in the group is allowed to execute transactions at any time, even transactions that change state (RW transactions). Any server may execute a transaction without any a priori coordination. But, at commit time, it coordinates with the rest of the servers in the group to reach a decision on the fate of that transaction. This coordination serves two purposes: (i) check whether the transaction should commit or not; (ii) and propagate the changes so that other servers can apply the transaction as well. As a transaction is sent through an atomic broadcast, either all servers in the group receive the transaction or none do. If they receive it, then they all receive it in the same order with respect to other transactions that were sent before. Conflict detection is carried out by inspecting and comparing write sets of transactions. Thus, they are detected at the row level. Conflict resolution follows the first committer wins rule. If t1 and t2 execute concurrently at different sites, because t2 is ordered before t1, and both changed the same row, then t2 wins the conflict and t1 aborts. In other words, t1 was trying to change data that had been rendered stale by t2. If two transactions are bound to conflict more often than not, then it is a good practice to start them on the same server. They then have a chance to synchronize on the local lock manager instead of aborting later in the replication protocol. In a Group Replication topology, care needs to be taken when executing data definition statements also commonly known as data definition language (DDL). Given that MySQL does not support atomic or transactional DDL, one cannot optimistically execute DDL statements and later roll back if needs be. Consequently, the lack of atomicity does not fit directly into the optimistic replication paradigm that Group Replication is based on. Therefore, more care needs to be taken when replicating data definition statements. Schema changes and changes to the data that the object contains need to be handled through the same server while the schema operation has not yet completed and replicated everywhere. Failure to do so can result in data inconsistency. If the group is deployed in single-primary mode, then this is not a problem, because all changes are performed through the same server, the primary. MySQL DDL execution is not atomic or transactional. The server executes and commits without securing group agreement first. As such, you must route DDL and DML for the same object through the same server, while the DDL is executing and has not replicated everywhere yet. 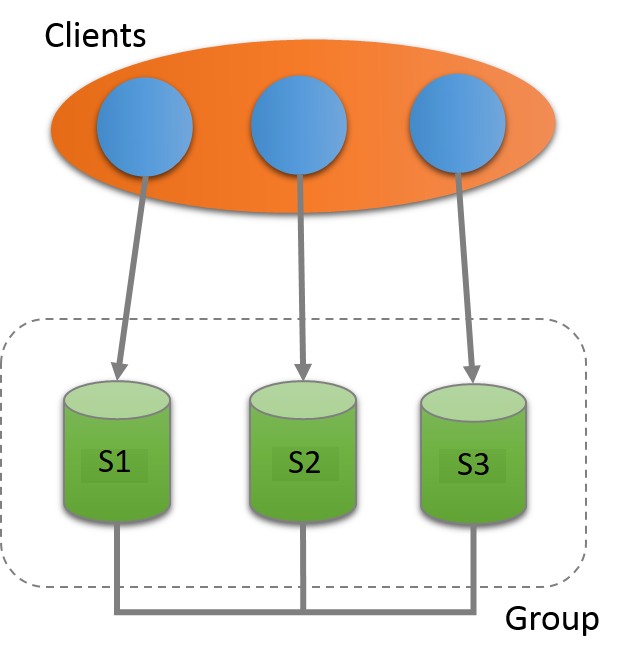 This section describes the process through which a member joining a group catches up with the remaining servers in the group, called distributed recovery. This section is a high level summary. The following sections provide additional detail, by describing the phases of the procedure in more detail. 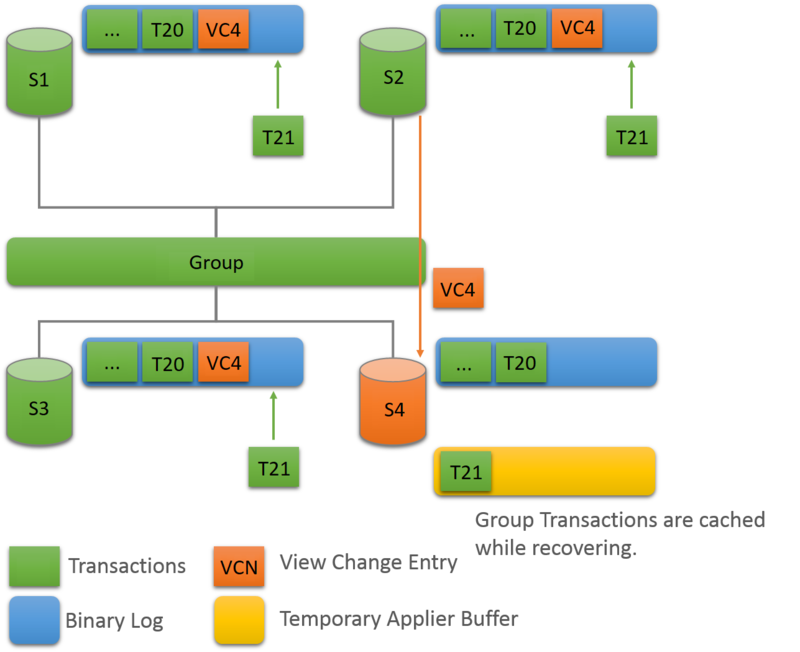 Group Replication distributed recovery can be summarized as the process through which a server gets missing transactions from the group so that it can then join the group having processed the same set of transactions as the other group members. During distributed recovery, the server joining the group buffers any transactions and membership events that happen while the server joining the group is receiving the transactions required from the group. Once the server joining the group has received all of the group's transactions, it applies the transactions that were buffered during the recovery process. At the end of this process the server then joins the group as an online member. In the first phase, the server joining the group selects one of the online servers on the group to be the donor of the state that it is missing. The donor is responsible for providing the server joining the group all the data it is missing up to the moment it has joined the group. This is achieved by relying on a standard asynchronous replication channel, established between the donor and the server joining the group, see Section 16.2.3, “Replication Channels”. 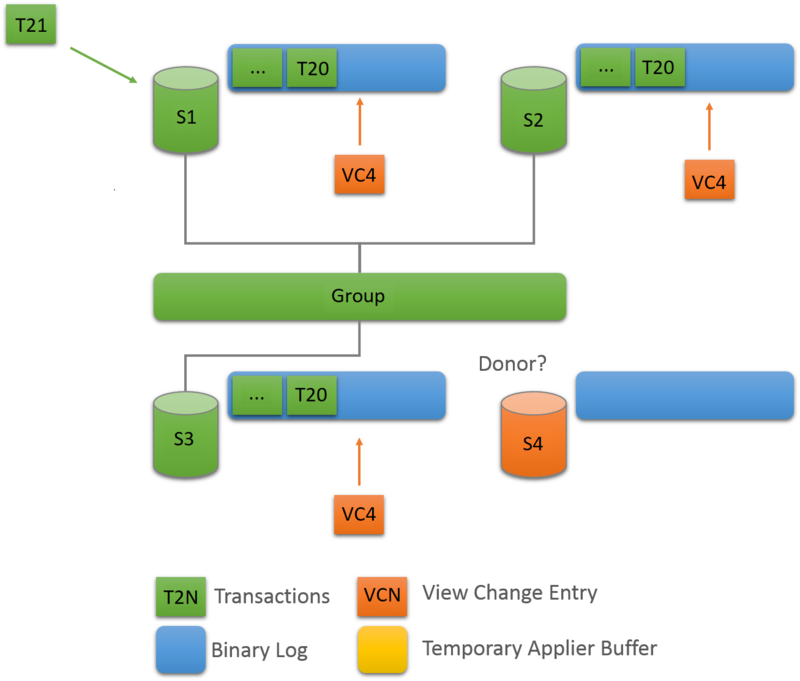 Through this replication channel, the donor's binary logs are replicated until the point that the view change happened when the server joining the group became part of the group. The server joining the group applies the donor's binary logs as it receives them. While the binary log is being replicated, the server joining the group also caches every transaction that is exchanged within the group. In other words it is listening for transactions that are happening after it joined the group and while it is applying the missing state from the donor. When the first phase ends and the replication channel to the donor is closed, the server joining the group then starts phase two: the catch up. In this phase, the server joining the group proceeds to the execution of the cached transactions. When the number of transactions queued for execution finally reaches zero, the member is declared online. The recovery procedure withstands donor failures while the server joining the group is fetching binary logs from it. In such cases, whenever a donor fails during phase 1, the server joining the group fails over to a new donor and resumes from that one. When that happens the server joining the group closes the connection to the failed server joining the group explicitly and opens a connection to a new donor. This happens automatically. To synchronize the server joining the group with the donor up to a specific point in time, the server joining the group and donor make use of the MySQL Global Transaction Identifiers (GTIDs) mechanism. See Section 16.1.3, “Replication with Global Transaction Identifiers”. However, GTIDS only provide a means to realize which transactions the server joining the group is missing, they do not help marking a specific point in time to which the server joining the group must catch up, nor do they help conveying certification information. This is the job of binary log view markers, which mark view changes in the binary log stream, and also contain additional metadata information, provisioning the server joining the group with missing certification related data. To explain the concept of view change markers, it is important to understand what a view and a view change are. A view corresponds to a group of members participating actively in the current configuration, in other words at a specific point in time. They are correct and online in the system. A view change occurs when a modification to the group configuration happens, such as a member joining or leaving. Any group membership change results in an independent view change communicated to all members at the same logical point in time. At the group communication layer, view changes with their associated view ids are then boundaries between the data exchanged before and after a member joins. This concept is implemented through a new binary log event: the"view change log event". 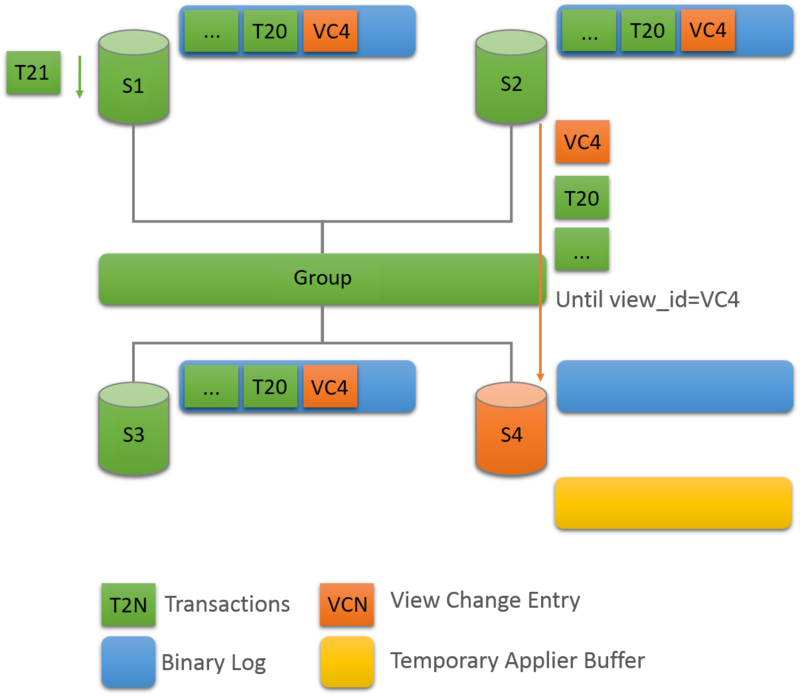 The view id thus becomes a marker as well for transactions transmitted before and after changes happen in the group membership. The view identifier itself is built from two parts: (i) one that is randomly generated and (ii) a monotonically increasing integer. The first part is generated when the group is created, and remains unchanged while there is at least one member in the group. The second part is incremented every time a view change happens. The reason for this heterogeneous pair that makes up the view id is the need to unambiguously mark group changes whenever a member joins or leaves but also whenever all members leave the group and no information remains of what view the group was in. In fact, the sole use of monotonic increasing identifiers could lead to the reuse of the same id after full group shutdowns, destroying the uniqueness of the binary log data markers that recovery depends on. To summarize, the first part identifies whenever the group was started from the beginning and the incremental part when the group changed from that point on. Distributed recovery does have some limitations. It is based on classic asynchronous replication and as such it may be slow if the server joining the group is not provisioned at all or is provisioned with a very old backup image. This means that if the data to transfer is too big at phase 1, the server may take a very long time to recover. As such, the recommendation is that before adding a server to the group, one should provision it with a fairly recent snapshot of a server already in the group. This minimizes the length of phase 1 and reduces the impact on the donor server, since it has to save and transfer less binary logs. It is recommended that a server is provisioned before it is added to a group. That way, one minimizes the time spent on the recovery step. There is a lot of automation built into the Group Replication plugin. Nonetheless, you might sometimes need to understand what is happening behind the scenes. This is where the instrumentation of Group Replication and Performance Schema becomes important. The entire state of the system (including the view, conflict statistics and service states) can be queried through performance_schema tables. The distributed nature of the replication protocol and the fact that server instances agree and thus synchronize on transactions and metadata makes it simpler to inspect the state of the group. For example, you can connect to a single server in the group and obtain both local and global information by issuing select statements on the Group Replication related Performance Schema tables. For more information, see Section 17.3, “Monitoring Group Replication”. This section explains how to use the available configuration options to gain the best performance from your group. To force the GCT do an active wait, use the group_replication_poll_spin_loops option, which makes the GCT loop, doing nothing relevant for the configured number of loops, before actually polling the queue for the next message. When network bandwidth is a bottleneck, message compression can provide up to 30-40% throughput improvement at the group communication level. This is especially important within the context of large groups of servers under load. Table 17.8 LZ4 Compression Ratios for Different Binary Log Formats. The TCP peer-to-peer nature of the interconnections between N participants on the group makes the sender send the same amount of data N times. Furthermore, binary logs are likely to exhibit a high compression ratio (see table above). This makes compression a compelling feature for workloads that contain large transaction. Compression happens at the group communication engine level, before the data is handed over to the group communication thread, so it happens within the context of the mysql user session thread. Transaction payloads may be compressed before being sent out to the group and decompressed when received. Compression is conditional and depends on a configured threshold. By default compression is enabled. In addition, there is no requirement that all servers in the group have compression enabled to be able to work together. Upon receiving a message, the member checks the message envelope to verify whether it is compressed or not. If needed, then the member decompresses the transaction, before delivering it to the upper layer. The compression algorithm used is LZ4. Compression is enabled by default with threshold of 1000000 bytes. The compression threshold, in bytes, may be set to something larger than default. In that case, only transactions that have a payload larger than the threshold are compressed. Below is an example of how to set a compression threshold. This sets the compression threshold to 2MB. If a transaction generates a replication message with a payload larger than 2MB, for example a binary log transaction entry larger than 2MB, then it is compressed. To disable compression set threshold to 0.